There are 26 Assisted Living Facilities in the Fall River area, with 3 in Fall River and 23 nearby. The average cost of assisted living in Fall River is $3,025 per month. This is lower than the national median of $3,346. To help you with your search, browse the 87 reviews below for assisted living facilities in Fall River. On average, consumers rate assisted living in Fall River 3.9 out of 5 stars. Better rated regions include Somerset with an average rating of 4.5 out of 5 stars. Caring.com has helped thousands of families find high-quality senior care. To speak with one of our Family Advisors about assisted living options and costs in Fall River, call (855) 863-8283. Fall River's motto of "Make It Here" hints at new starts for people of all ages and circumstances, which might be appealing to seniors looking to make a new home in an assisted living facility. Fall River is home to two assisted living residences, which is what the state calls assisted living facilities. In addition, 23 assisted living residences are located in nearby towns including Dartmouth and New Bedford as well as in East Providence and Tiverton, RI. These assisted living facilities all provide personal care to aging adults within a residential community. Personal care services include help with activities of daily living as well as medication management and the assurance of a secure, safe environment. Fall River is part of the larger metro area surrounding Providence, RI, and residents can take advantage of all the cultural and shopping opportunities in the capital city. Downtown Providence has been restored and is thriving, with a pleasant River Walk along the Providence River so seniors can enjoy a low-cost outing in a nearby city. Fall River has an array of community resources for seniors, including Bristol Elder Services, an organization that provides mobility assistance, counseling and other services, as well as four senior centers. Because Fall River is close to the Narragansett Bay and the Atlantic Ocean, its climate is moderate for the New England region, with snow melting quickly and sea breezes cooling hot summer days. Seniors can enjoy time outdoors between coastal storms. Fall River shares its public transportation system, the Southeastern Regional Transit Authority, with nearby New Bedford, with buses connecting towns all along the South Coast of Massachusetts. Senior CharlieCards let those 65 and older take advantage of 70 cent fares. The Worcester area is home to world-class medical facilities, including Southcoast Charlton Memorial Hospital, in the event of medical emergencies or illness. Assisted Living costs in Fall River start around $3,025 per month on average, while the nationwide average cost of assisted living is $4,000 per month, according to the latest figures from Genworth’s Cost of Care Survey. It’s important to note that assisted living rates in Fall River and the surrounding suburbs can vary widely based on factors such as location, the level of care needed, apartment size and the types of amenities offered at each community. Seniors who meet the financial qualifications may be eligible for assistance to help pay for their assisted living fees. 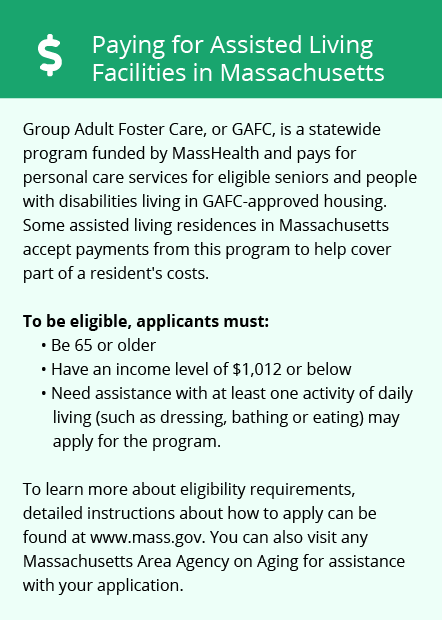 Low-income seniors can investigate the Group Adult Foster Care program, available through Medicaid and Mass-Health and SSI available through the Social Security Administration. Fall River and the surrounding area are home to numerous government agencies and non-profit organizations offering help for seniors searching for or currently residing in an assisted living community. These organizations can also provide assistance in a number of other eldercare services such as geriatric care management, elder law advice, estate planning, finding home care and health and wellness programs. To see a list of free assisted living resources in Fall River, please visit our Assisted Living in Massachusetts page. 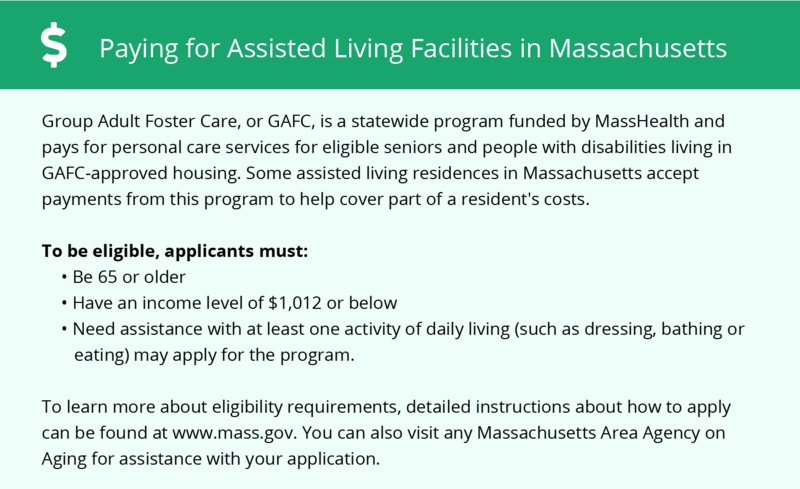 Fall River-area assisted living communities must adhere to the comprehensive set of state laws and regulations that all assisted living communities in Massachusetts are required to follow. Visit our Assisted Living in Massachusetts page for more information about these laws.